(From Zeiss lens literature) The ZEISS Milvus 2/35 of the type ZEISS Distagon is a moderate wide-angle lens that is ideal for capturing all scenes in their full natural brilliance -- nothing will escape its attention, even in poor light. Its compact design and fast, precise focusing make the lens particularly suitable for photojournalism. And thanks to its high performance and versatility, it is always ready for those unexpected moments. The excellent image performance of the ZEISS Milvus lenses is sharply focused on the requirements of current and future high-performance digital cameras. Thanks to the low level of stray light allowed by the lens design, high-contrast images are also possible with increasing high dynamic ranges of the sensors (HDR). The minimization of coma, astigmatism and spherical aberrations enables constantly high resolution over the entire image field. The optics are designed to ensure full utilization of the performance provided by high-resolution camera systems. Regardless of what the future holds -- with the Milvus lenses from ZEISS you are optimally equipped any time, any place. State-of-the-art camera systems and high-resolution digital image sensors are now demanding more and more performance from the lenses. The Floating Elements Design permits constantly high image performance in the focal plane -- from the minimum object distance to infinity. This is accomplished by changing the axial distance between individual lens elements or element groups. The adjustment of the element spacing is coupled to the distance setting so that it always results in the right correction. The mechanical design of the ZEISS Milvus lenses is highly complex and the workmanship must be extremely exact -- both specialties of ZEISS. 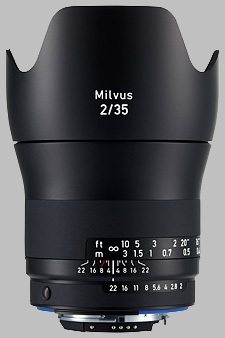 The Zeiss 35mm f/2 Milvus 2/35 doesn't have any user reviews yet!